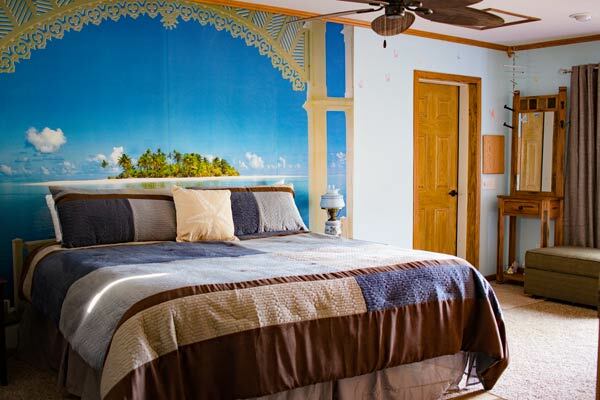 Escape to an island paradise as you enjoy this romantic yet tastefully-decorated suite with a full wall mural of a restful shoreline scene complete with beach and palm trees. Elegant plush carpeting in this suite enhances a private bedroom with super-king size bed with pillow-top, memory-foam mattress, adjustable controls and a variety of pillows so you can choose the one that’s perfect for you. Suite includes a cozy loveseat that pulls out to become a twin-size bed. Experience the softness of 900-threadcount bed linens. Your suite also includes a private dining area with hardwood floor and small table with two chairs, perfect for playing board games or enjoying breakfast in the privacy of your suite. 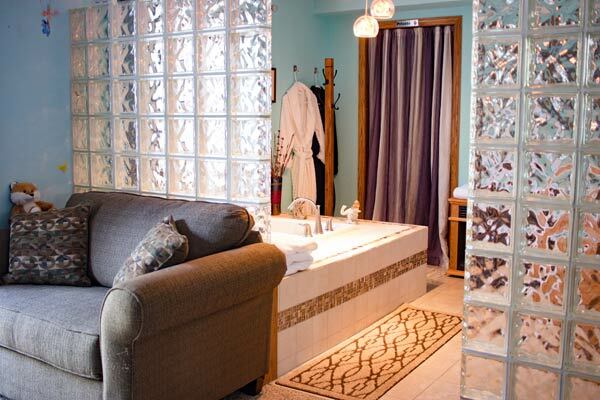 Set off by a glass block wall, your oversize bathroom with heated tile floors, cozy fireplace and romantic lighting, all calling you to indulge yourself in the deep whirlpool jacuzzi tub, while a privacy wall sets off the toilet and separate glass-enclosed circular shower with rainwater head. Lounge comfortably in the extra-plush his and hers bathrobes furnished. Come and go as you like through your private entrance, with sliding glass patio doors opening to your private patio with sitting area, fountain, flowers and trees. 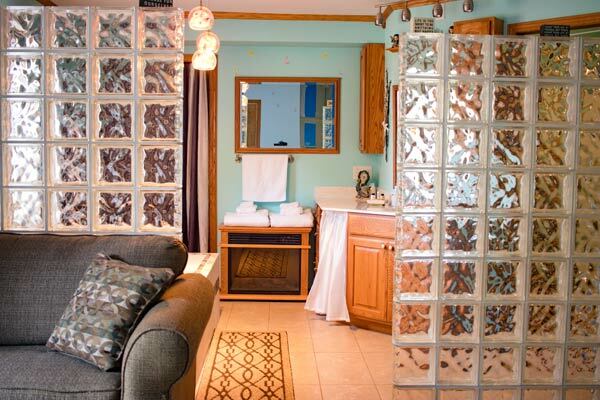 Relax and enjoy the large flat-screen TV with literally hundreds of DirecTV channels and DVD player. 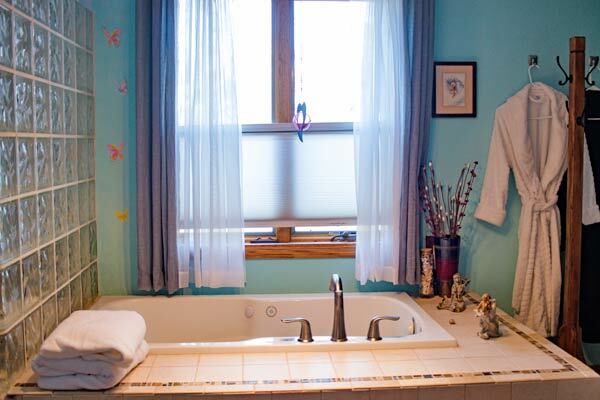 Suites have a kitchenette with wet sink, formica-top counter, refrigerator stocked with bottled or sparkling water, ice bucket with complimentary beverage, microwave, coffeepot, and a basket of creamers, sweeteners, hot chocolate and tea. 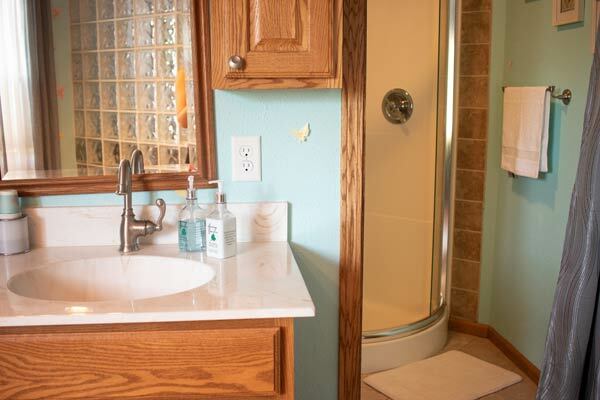 You’ll have plenty of cupboards, dresser space and closet space. Three nice windows offer fascinating sights of the marsh and its sandhill cranes, geese, deer and other wildlife.